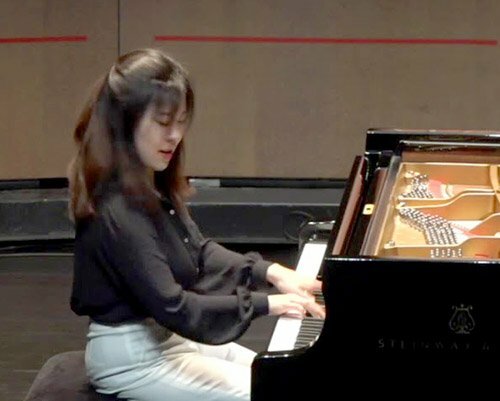 At the first weekend of the Foundation for Chinese Performing Arts 27th Annual Music Festival at Walnut Hill School, the hugely talented and expressive pianist Xiaopei Xu gave a challenging program that spanned nearly three centuries—from J.S. Bach’s French Suite Number 2, BWV 813, to the John Musto Improvisation and Fugue, written in 2008. Throughout, Xu showed Sunday’s enthusiastic concertgoers that she is ready to play anything and everything. The C Minor French Suite, written between 1721 and 1725, the first version of which may be found in the Clavierbüchlein for Anna Magdalena Bach, is reflective and requires vision. Xu brought this to the keyboard, giving the Allemande precisely execution, with excellent phrasing and lines—like a walk on a crisp fall morning (though outside the evening was rain-filled and muggy). The Courante flowed as rapidly as a brook in April, with fine definition. The Sarabande felt a bit ponderous, but most performers deliver it with heavy hands. She gave the Air, and Menuet superbly crafted readings, though the Gigue needed a sprightlier touch. The Drei Klavierstücke, D. 946, written only a few months prior to Schubert’s death, require both fire and tenderness and, for sure, focus. Pianists have recorded these works with various speeds and inflections. Here, Xu exhibited forethought and concentration, yet a bit of impatience. Many moments were magical, but a bit more tenderness, which seemed brimming under the surface, would have been welcome. That being said, she nailed the lively C major third piece, which is more modern than the other two, given its syncopation and modulations. Her post-intermission rendition of Musto’s Improvisation and Fugue was inspiring. Written for Mark Horowitz in 2008, it is difficult but exquisite. The Improvisation, according to Musto, “a rumination on the blues,” becomes progressively faster, in four stages, before reverting to the initial theme. Xu’s delivery spellbound us; she then launched into the fugue with a near-perfect touch; it melds elements of the Improvisation, finally ending with a reprise of the original theme. Xu should perform more modern music. The evening ended with the 4 Mazurkas, Opus 67, by Chopin followed his Ballade Number 4, Opus 52 in F Minor. To some extent, a bit more relaxation into each of the Mazurkas would have made them sound even more poignant. The four are G Major, G Minor, C Major and A Minor. The first is almost impossible to articulate without sounding gruff, but Xu managed. The second is lyrical and thoughtful, while the third, the best known, should appropriately be played with some purposeful hesitation. Though Xu interpreted the touching 4th with excellent intent, she could have lingered just a bit longer with each. She then launched into Ballade Number 4, which she performed with verve, but again might have done so with more clarity and anticipation. Having finished the Ballade, she smiled and bowed in happy relief. The audience brought her back for multiple bows, some of us hoping, in vain, to hear an encore. Xu possesses technique, musicality and breadth—everything she needs to entrance her audience. When she senses that depth within her being, she is likely to become matchless. Pianist and congenital music lover Julie Ingelfinger enjoys day jobs as professor of pediatrics at Harvard Medical School, pediatric nephrologist at MassGeneral Hospital for Children and deputy editor at the New England Journal of Medicine.